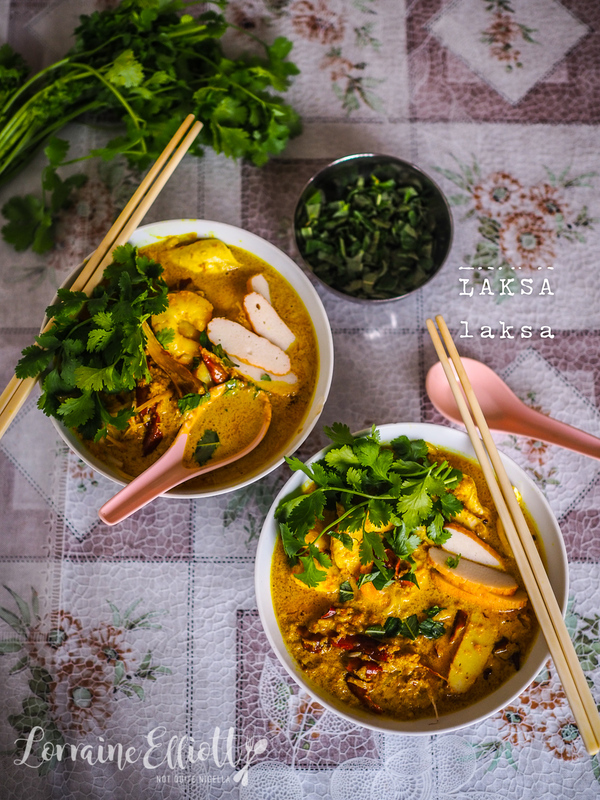 Dear Reader, this is my mother's amazing laksa recipe. Although there are many kinds of laksa (eg. Penang laksa which has a pronounced sourness from tamarind or Thai laksa made with red curry paste), we just call this "mother's laksa" or curry laksa and comes from her treasured folder of recipes (where there are countless ones we haven't yet explored). 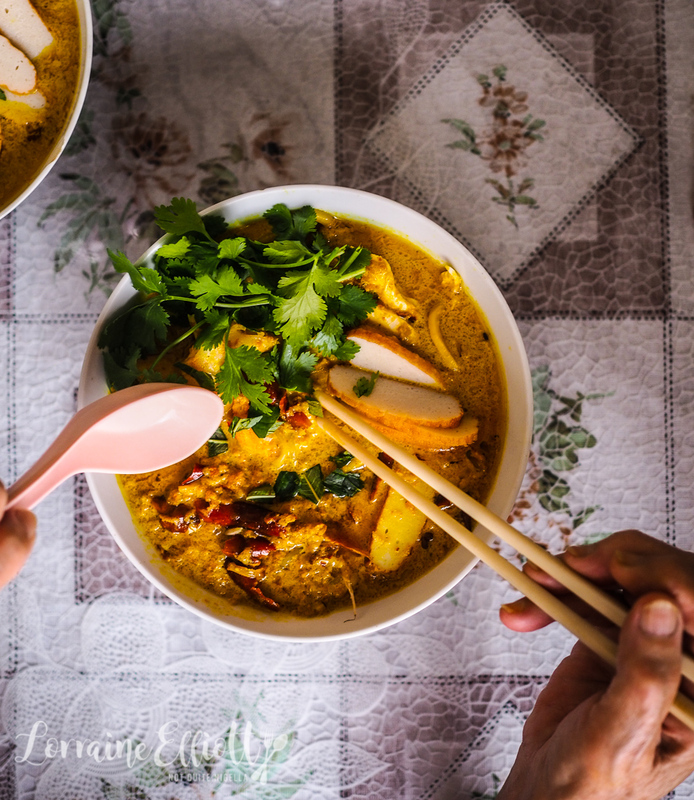 Her curry laksa recipe is gutsy, bold and smooth if such a combination exists. It's like you know you're being charmed by someone confident, but you don't care. Normally my mother doesn't put chicken in her laksa, it's strictly a seafood affair but we did because people do tend to love chicken and seafood laksa from what I've seen. We also omit vermicelli noodles quite simply because my sister and I don't really like them in laksa and prefer thicker, chewier Hokkien noodles. What I'm trying to say is that apart from this wonderful broth bursting with flavour and vigour, you can play with the toppings and the noodles. I am not fond of Vietnamese coriander, finding it too strong while I love regular coriander. And while I like the idea of bean curd puffs, I find them dry and inevitably disappointing so we don't tend to add those. But really you can go wild, put whatever you want really in this delicious soup. As I mentioned, this is a curry laksa as opposed to the Asam or sour laksa. There are literally at least 25 types of laksa. 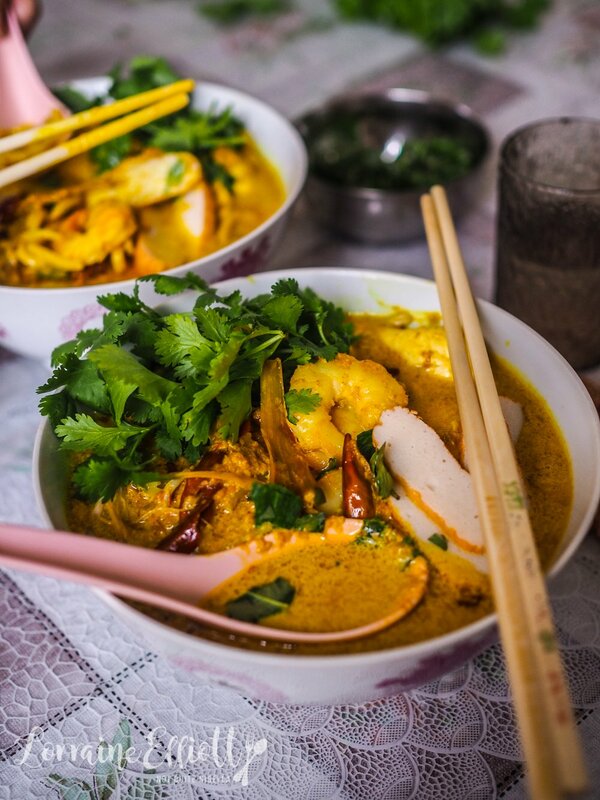 This curry laksa hails from my mother's homeland of Singapore. I prefer this curry laksa to the sour Asam laksa because it uses coconut milk whereas Asam doesn't and if there is a coconut milk option, I always tick it. For me the gutsiness of laksa is from shrimp paste (belachan) and dried shrimp while the candlenuts to give it texture. I'm afraid that you can't really skip those three ingredients to some significant detriment. But if you go to an Asian grocery store you'll be able to snag all of the ingredients in one go (except maybe the Vietnamese coriander, I find that is hard to find where I live). 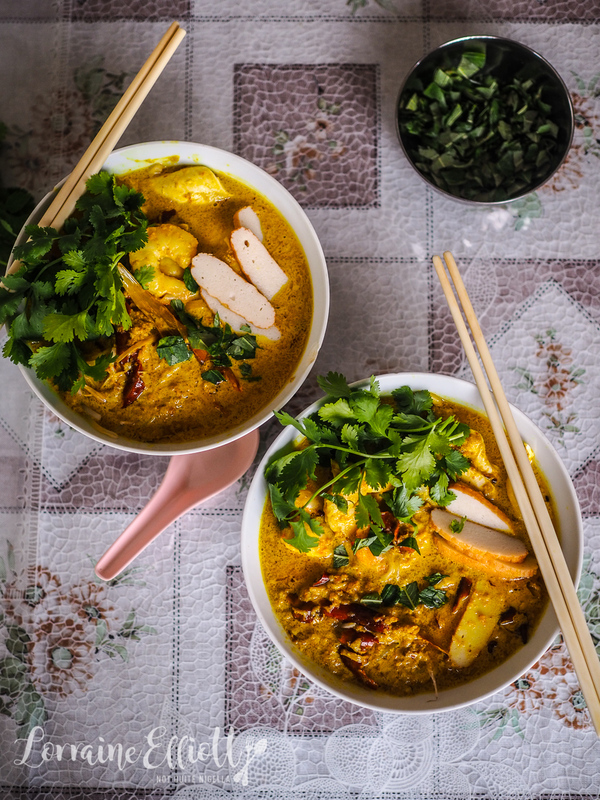 You might be surprised to know that there are surprisingly few spices added to curry laksa apart from coriander and turmeric. You may unfriend me Dear Reader, but the first time I tried laksa, I wasn't in love with it. To me, it was super oily and messy to eat (two points, I've since revised into positives). I feel like everyone in the 2000s was eating laksa, even at work and some would come back from lunch, business attire stained orangey yellow from the oil. In my advertising days there was one guy who worked in our department. He wasn't particularly well liked and his name was often mentioned with a roll of the eyes. He was a sycophant always trailing the boss and I think if he could have rapped he would have because the world needs more corporate gangstas in a suit and tie. I remember one day he came back to work after lunch the bottom of his tie a bright yellow orange. He was too busy trying to show his prowess at being up to date with eating "crazy things" like laksa that he sat down at the table and his tie fell into the bowl of laksa! So tell me Dear Reader, what is your favourite type of laksa? And coconut milk or no coconut milk for you? Are you a messy eater and have you ever gotten laksa stains on your clothing? Buyer's tip: dried chillies, belachan, dried shrimp, candlenuts and fish cakes can be found at Asian grocery stores. Vietnamese mint may be a little trickier to find depending on the area but you can also use regular mint too. And macadamias can substitute for candlenuts in a pinch. 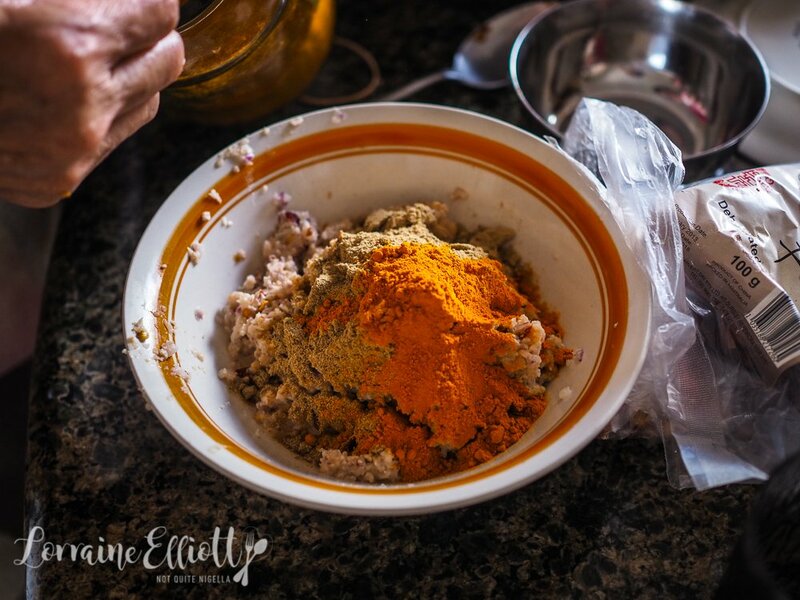 Step 1 - Place the onions, chillies, shrimp paste, dried prawns and candlenuts in a food processor and make a paste. 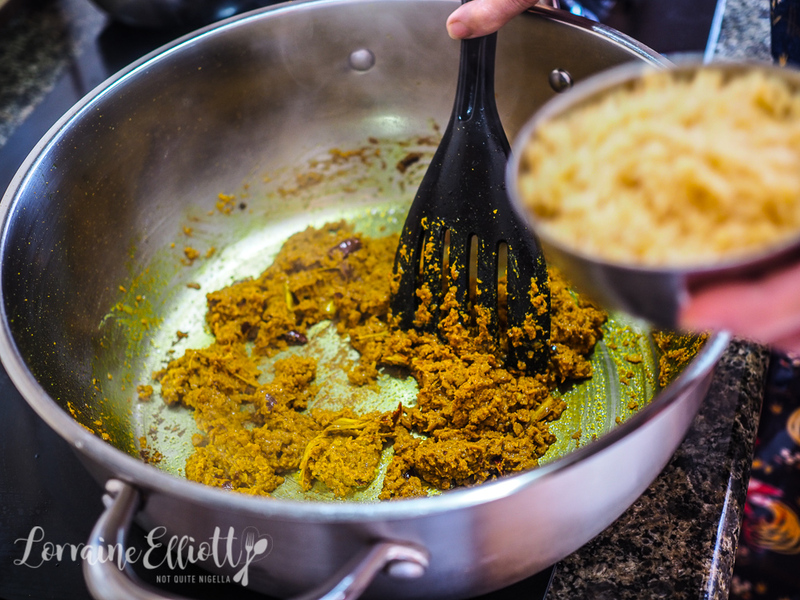 Empty into a ceramic or glass bowl and mix in the coriander and turmeric (I avoid putting turmeric in the food processor as it tends to stain the plastic yellow). Step 2 - Add oil to a large frypan or wok and fry off the spice paste and lemongrass. Cook on high heat until oil separates out. Add chicken or seafood stock and then add the coconut milk mixing well. Season with salt, pepper and sugar to taste. Step 3 - Place a large pot of water to boil and gently separate hokkien noodles and immerse in water for a minute and then add the bean sprouts and cook for an additional 30 seconds. Place in a strainer and run cold water over the noodles and sprouts and divide the mixture between four to six bowls. Add the prawn, chicken, and fish cakes on top and then spoon over the soup mixture. Dress with Vietnamese mint. recipeMy Mother's Seri Muka Kueh Dessert! featureMy Mother's Bakkwa or Asian Jerky!